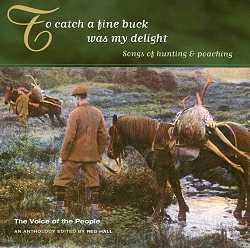 If you had asked me to guess which volume of the series would contain one of my all time favourite song performances, I would not have chosen the anthology of hunting songs. So do not hesitate, as I did, to play this one and listen to the singing of Geordie Hanna and On Yonder Hill there sits a Hare (sound clip). I defy you to be unmoved by the expressive lilting phrasing and the heart-stopping pauses in what is a truly breathtaking performance which demands that you stop and listen. The majority of the songs reflect the relationship of the working man with hunting and describe hunting on foot for the hare and fox or tell of the prowess of the all important dogs. Many of the songs deal with the lot of the poacher, whether cruelly mistreated in gaol, cut down in brave fights with the keepers, or catching game for the pot to feed a hungry family. As Reg Hall's notes say, the poachers' exploits are celebrated in these songs and for singers like Pop Maynard and Wiggy and Jasper Smith they are heroic figures. The songs of the southern and eastern counties of England and Ireland are well represented, the Borders and the North East less so, and surprisingly there is nothing from most of northern England. However I do not know enough about the available material in the Topic archive or from other sources to comment any further on this. Also I see very little point in saying what I would have liked to include - I didn't get the job of compiling the series! There are only two music tracks, and I was left wanting to hear more of both musicians. The uilleann piper, Felix Doran delivers a sound picture in The Fox Hunt, complete with baying hounds, the huntsman's horn, panicked chickens and a dying fox. This is something of a novelty performance piece and will probably pall with repeated listening, so I wish there had been more of him. George Tremain, who was the musician for the North Skelton longsword dancers, plays out the CD with the Huntsmans Chorus and has an uplifting light touch on the melodeon. Once again the value of the series is the staggering variety of singing styles that it makes available to us and there are some widely diverse performances on this CD. We have the lusty rousing choruses and huntsman's whoops of Willie Scott in the full flood of a live performance - The Irthing Water Hounds - and he also sings the wonderful Kielder Hunt. We have the softer, more intimate beauty of the travellers' singing as they recount the injustices done to the poachers with The Oakham Poachers (sound clip) and Thorneymoor Park from Wiggy and Jasper Smith respectively, and Bold Keeper from Harry Brazil. There is the thoughtful quiet mastery of Walter Pardon who sings The Poachers Fate, and the rich irreverant voice of Bob Roberts recounting with glee getting one over on the keepers in While Gamekeepers Were Sleeping. I paticularly liked Out with my Gun in the Morning by Jimmy Knights who was 95 when recorded and still singing with strength, conviction and obvious relish for the joys of his country life. I love the line about his 'dear little wife' - "Perhaps other women would fairer be, but she is my own and she just suits me" (sound clip). The measured, almost poetic timing of Joseph Taylor makes The White Hare one of the outstanding tracks on this CD - the quality and clarity of this recording from 1908 is remarkable. Pop Maynard, who can be heard on many other volumes too, here sings another wonderful song - William Taylor. There are two entertaining childrens songs, The Hungry Fox from Harry Burgess and The House that Jack Built from Charlie Wills. I must admit I have difficulty in appreciating some of the Irish recordings as I found a few of the tunes rather dull and the songs unremarkable. That said, these songs did introduce me to the lyrical singing and sheer presence and character in the voices of Big John Maguire, Jimmy Halpin and Philip McDermott and I want to find out more about all of them. Philip McDermott's singing of The Reaping of the Rushes Green (sound clip) is particularly stunning. I was disappointed by the Jack Elliott track Champion He Was A Dandy, and did not like the song, the performance or the recording (a live club recording from the 60's with highly irritating foot tapping throughout). I will have to listen to material other than this to fully appreciate his singing. I can heartily recommend this CD and find that I return to it again and again and I certainly wouldn't be without Geordie Hanna now that I've heard him.